A nurse is an assistant to a doctor, who helps them in looking after the patient in a clinic or hospital. A nurse, especially a registered nurse, should have a thorough qualification and the necessary knowledge to work in the field of medicine and healthcare. Therefore, a nurse should not only be a qualified assistant, but they should also be able to form bonds with the patients. 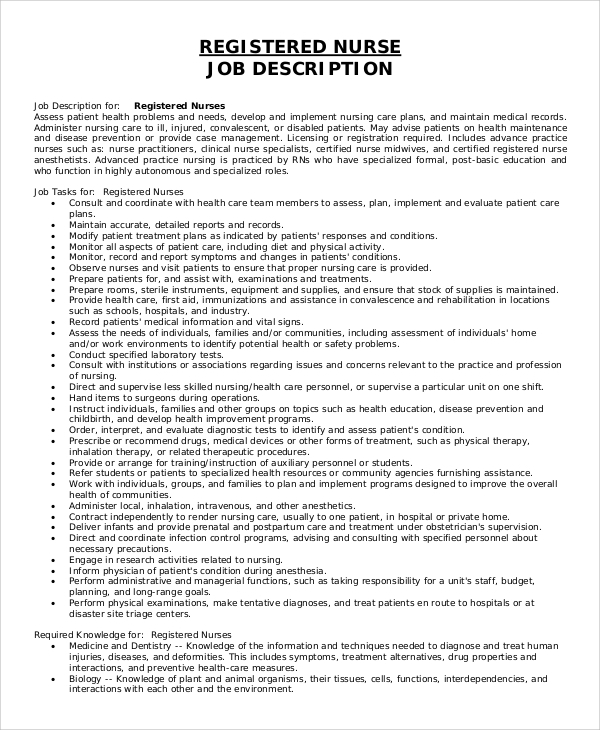 Given below is a list of Job Description Samples for a registered nurse. A job description for a registered nurse will obviously require a registered nurse who has the necessary educational qualifications and related experience in working as a nurse. Such a job description template should also mention the salary payable to the applicant if they get selected. 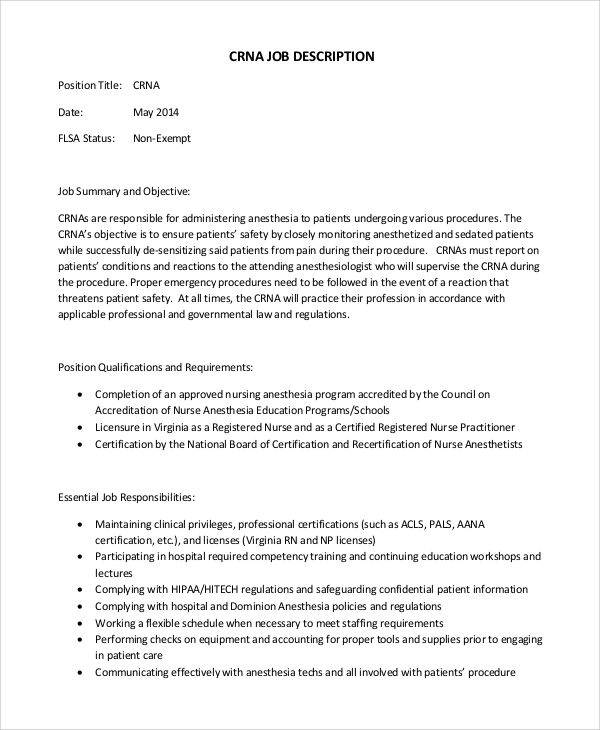 This job description template seeks to recruit an applicant who is not only a registered nurse with the appropriate qualifications and the required experiences but is also a specialist with regards to the administration of anesthetics to patients who are to be operated upon. 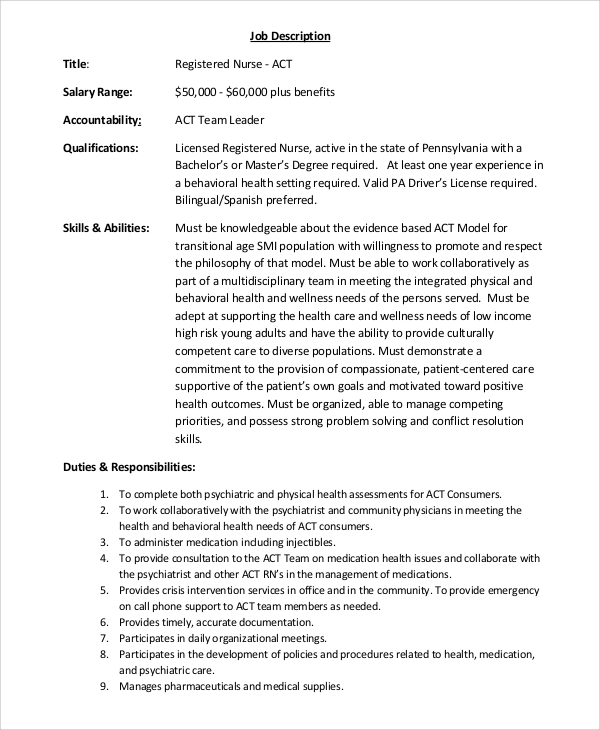 You can also see the Medical Assistant Job Description Samples. 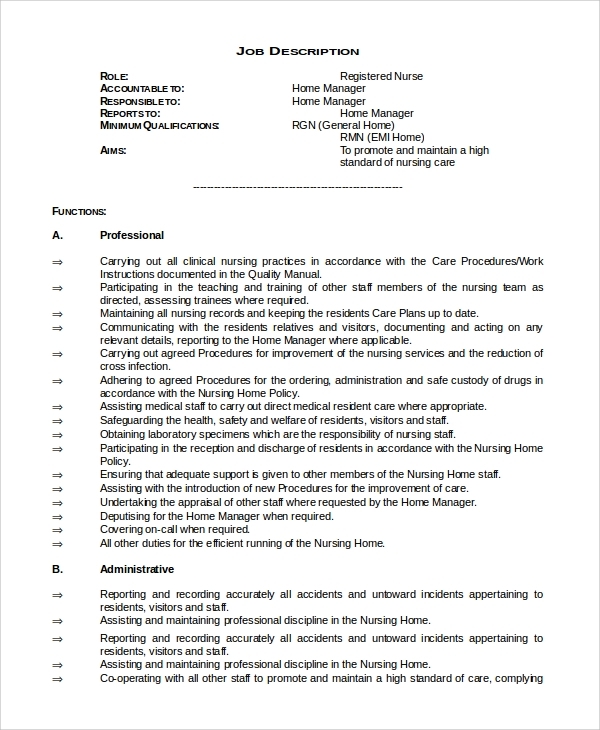 A job description for a registered nurse should contain the required qualifications and experiences of an applicant, the salary payable to them if selected, and any duty or responsibility that may be associated with the job they’re applying for. The job description should stress on the friendliness and the ability of the applicant to bond with the patient. The above Sample Job Description are useful for recruiting registered nurses whose skills and ability will be of immense help to not only healthcare professionals, hospitals or clinics hiring them but also for the patients who will benefit from the nurse’s skills and abilities to look after them. A registered nurse who wants to be applied to the care of patients who are bedridden at their homes needs to have special qualifications. 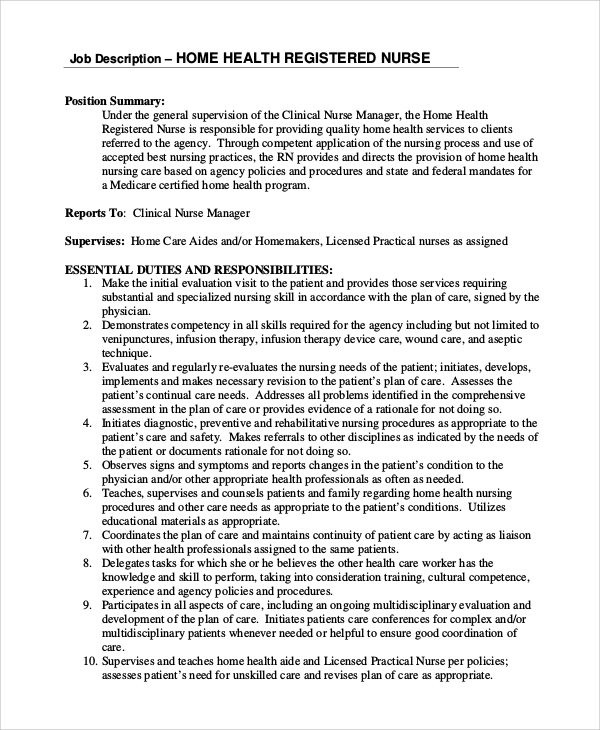 In this regard, this job description template should specifically mention the nurse’s duties and at the same time demand that the applicant has the necessary qualifications and the ability to take care of the patients assigned to them. 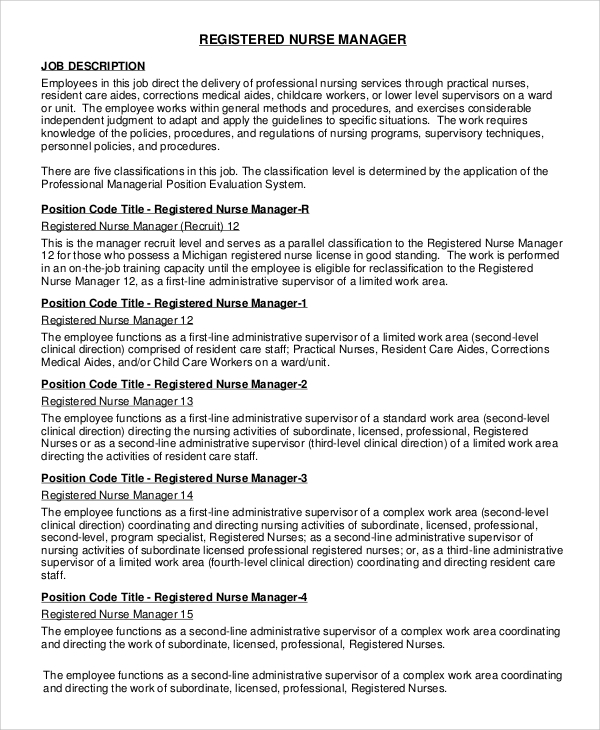 A Registered Nurse Manager Job Description Samples is an important position within a hospital or a clinic. Their job description should include their qualifications and abilities to manage patient as well as nurses and to assign and delegate tasks at which particular nurses are good at. 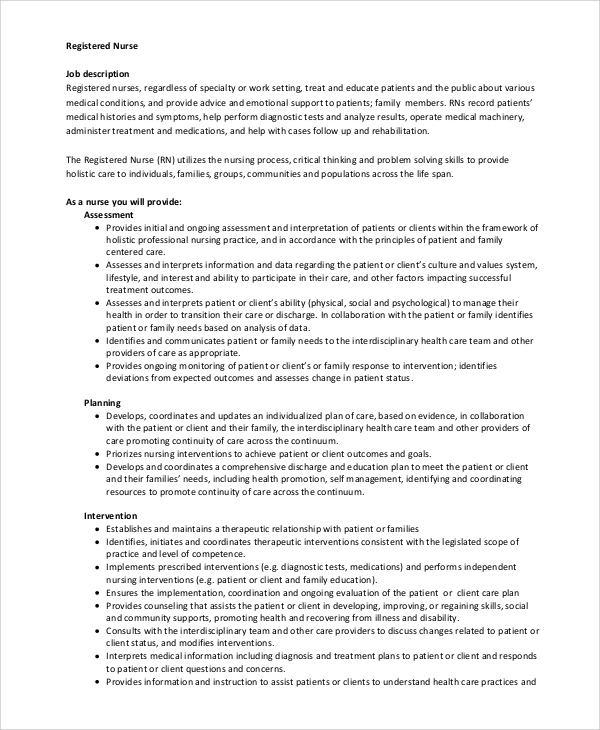 The above Job Description is aimed at healthcare professionals, hospitals, and clinics who wish to recruit the necessary and qualified registered nurses in their service. The sample templates will give the concerned an idea of how to format a good job description. 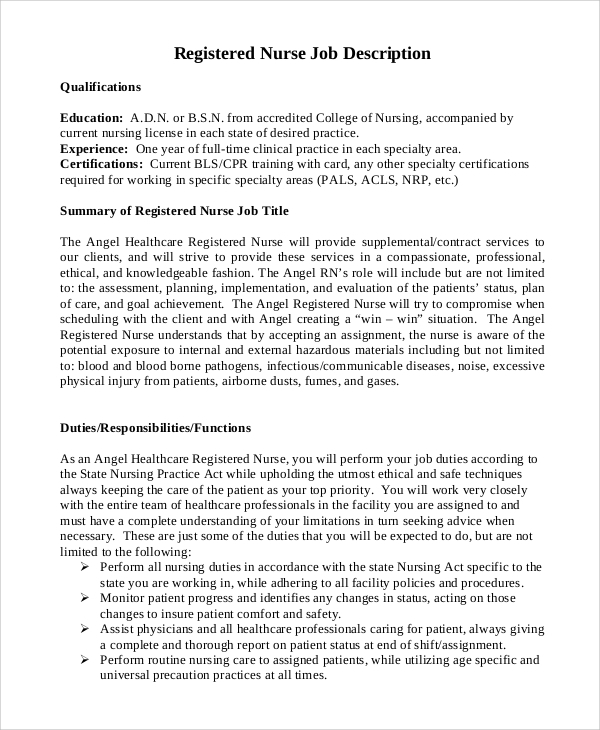 We have a broad range of sample job description templates for registered nurses. The samples are completely editable, and they can be used as a guide in composing a CNA Job Description Samples for registered nurses.